The notion that money fixes shortcomings in education is put under stress by NAPLAN data made public this week. Year 9 achievement data – the most senior year in the survey – for the four secondary schools in Alice Springs are inversely proportional to the money spent per student (see table). It is also noteworthy that Year 9 enrolments in the three private secondary schools, Our Lady of the Sacred Heart, St Philip’s and Yirara, outnumber that of the public Centralian Middle School by more than six to one. We have asked the four principals to comment and – as always – extend the same invitation to our readers. Meanwhile Education Minister Peter Chandler says national literacy and numeracy results show encouraging improvements in the early school years but, highlight that more work needs to be done. There are significant increases in Territory students average scores in Year 3 for reading, grammar and punctuation in 2015 compared to the 2008 base year. Mr Chandler says the results released reinforce the need for the government to keep investing in early years education and creating a job-ready generation. 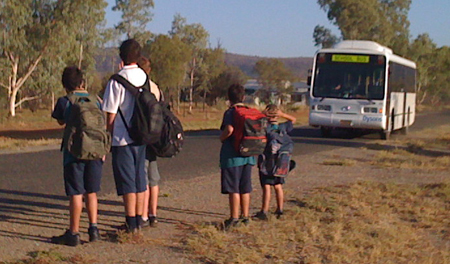 “There can be no sugar-coating the fact that the Northern Territory continues to be ranked seventh out of all the states and territories, this is mainly attributable to isolation, a large proportion of students from low socio-economic backgrounds and poor attendance in our remote schools. “We recognise that there are improvements to be made, particularly in Year 7 and Year 9, which is why we are implementing recommendations of the Middle Years Review. Money is obviously helpful, but it depends on how it is spent. I would think that good teaching and good parent support is really helpful in the secondary years. In addition, as a secondary school principal, I’m strongly aware of the great importance of good teaching and good parental support in the pre-primary and primary years. Interesting article “NAPLAN lesson on Money and Education”. I see most responses and opinions seem focused on NAPLAN testing and how it impedes or enhances the learning process for teachers and students while providing useful data to assist in tracking student and school performance at a national level. This data is also used politically to justify funding allocation, programs, policies etc according to the findings and recommendation of the latest review, with terms of reference written to meet the ever changing political agendas re education in general, and specifically for the delivery of education for students living in remote locations. So again energy and resources focus on accommodating the latest requirements of various organisations and service providers re: politically influenced staffing, curriculum and methodologies, while students are just statistics not active participants. In this article Mr Chandler’s analysis of the poor performance in the Territory being “mainly attributable to isolation, a large proportion of students from low socio-economic backgrounds and poor attendance in our remote schools” again placing the blame away from the history of “systems failure to deliver”. The Minister goes on to say “which is why we are implementing recommendations of the Middle Years Review”. • A strong sense of accountability for improving Indigenous student outcomes. Maybe the Education Department executive officers who have held senior positions in the NT for decades, and who have been involved in many reforms and numerous reviews can provide some wisdom and leadership around matters of accountability and leadership. There is much still to learn. I quote the last two paragraphs of Desert School Neville Green published in 1983: “Absenteeism seemed to be the major barrier to education in the western desert and teachers wrestle with the seemingly impossible task of getting children to school and keeping them there long enough to learn. “I heard teachers ask: ‘Why won’t they come to school?’ ‘Why don’t the parents send them?’ And I wonder if we are asking the wrong questions. “Why should these children come to school? Why should the parents make them attend? How can we involve Aborigines in the education of their children? To practice the style of a test helps students – even adult students approach tests in a calmer state of mind, thus producing more accurate results. Approaching the unknown can be quite terrifying. With low success rate from many NT rural students regular practice using similar question and answer style to NAPLAN testing may assist building student confidence then return better results. @ Janet Brown: Did you not practice before passing your driving licence? A test to prove your ability to drive? From primary to university levels, you practice to pass your tests; is it not what learning establishments are for? The following come from the Dept. of Education site – please take note of the spelling mistake : prast instead of past. So, should we blame our kids? Prast tests can be used by teachers to review units of work studied in class and familiarise students with the test language, layout and structure. • review of units of work being studied. Online practice tests are available at http://www.smeebu.com. The free practice tests contain numeracy and language Conventions questions which are suitable for Year 3 and 5 students. The tests can be taken individually, or can be used in class with an interactive whiteboard. Score sheets for each type of test will help teachers to diagnose the strengths and weaknesses of their students. Rather than looking at the total score, focus on the questions where the class or groups of students had difficulty. Discuss the language and concepts of these questions. Janet Brown: That’s only partially true, though imperfect NAPLAN does assess students’ skills. Take the NAPLAN reading test. Students are presented with a text they haven’t seen before and they have to read it and then answer comprehension questions. If the practice for this test is parents and teachers providing unknown texts and then testing for comprehension they are teaching reading, while also teaching for the NAPLAN test. Comprehension is the best predictor of reading levels. A lot of NAPLAN testing can’t be cribbed and if teachers and parents focus on it then that is a good thing with positive education outcomes well beyond the test. In Aboriginal schools a significant obstacle has been students memorising texts and so appearing to be better readers than they are. NAPLAN has encouraged remote schools to focus more on real learning, such as the skill to not just read but also understand. Paul: My research found books at supermarkets and for students to practice the NAPLAN for each grade. How can this possibly be a true assessment of students’ abilities? @Janet Brown. Yes, we are an English speaking country but how can you help your children if you do not speak English? The rightful residents of our region have been in contact with the English language for only 155 years. The new migrants have a very small knowledge of English and are used to a different system of education. I am a vey good mathematician, I have taught sciences 30 years ago, alas I could not help my grand children, without going back to school and learn the new age method of teaching. Another proven fact: Many teachers are teaching or may be suddenly asked to teach outside of their area of expertise. This means that a teacher may not know the content and how to teach it. In those situations teachers and students will be disadvantaged. Teaching is far more than having knowledge and skills. -Supporting student learning through consistent application of effective teaching and learning principles. Using authentic learning experiences which promote problem solving, critical thinking, inquiry and creativity is a skill; a skill which can be useful only if the teacher understands and respects the students of different backgrounds instead of treating them with contempt. Janet Brown, Posted August 7, 2015 at 10:49am: I disagree with your view of NAPLAN. It tests individuals’ skills in literacy and numeracy achieved over time through education. The NT results reflect failure through NT schools of far too many students to achieve demonstrable competence in English, oral, reading, writing, mathematics then other subjects. Competence in English, oral, written, reading and mathematics remains relevant to all youth seeking to improve things for themselves in Australia. Abusive neglect by Education and Welfare departments fail youths, thus causing these students to fail. Yirara reflects the government’s failure to protect and ensure children do achieve reasonable standards to achieve wider opportunities in life after school. Government refusals to call to account students and families says schooling is NOT compulsory, this their significant contribution to current test failings. Is government content to accept the costs from ongoing failures? The Commonwealth Parliament is refusing to demand national standards be satisfied, prevents alternative opportunities in life from developing. The rhetoric of victim culture helps few. We are an English speaking country. The comments about those with another native tongue and parents who have not encouraged and assisted their children to obtain the necessary assistance for English are the problem. The NAPLAN test is an utter joke and a total waste of teachers’ time and energy. Also a total waste of money as the outcomes are flawed. Parents are responsible to ensure their children have English language skills. To those who raised the issue: Well done, it is a real issue. And it also has less than .1% of children in this issue. I agree with Jungarrayi. We have also a rise in residents who speak a language other than English at home, a fact that makes it difficult for the children. Source: Australian Bureau of Statistics, Census of Population and Housing 2006 and 2011. Compiled and presented in profile.id by .id, the population experts. Quite often the ideas of those tests stressed the students and they do not perform as well as adults want them to do. Churchill struggled in school and failed the sixth grade. Most of us take Einstein’s name as synonymous with genius, but he didn’t always show such promise. Einstein did not speak until he was four and did not read until he was seven, causing his teachers and parents to think he was mentally handicapped, slow and anti-social. Eventually, he was expelled from school and was refused admittance to the Zurich Polytechnic School. It might have taken him a bit longer, but most people would agree that he caught on pretty well in the end, winning the Nobel Prize and changing the face of modern physics. Darwin was often chastised by his father for being lazy and too dreamy. Darwin himself wrote: “I was considered by all my masters and my father, a very ordinary boy, rather below the common standard of intellect.” Perhaps they judged too soon, as Darwin today is well-known for his scientific studies. In his early years, teachers told Edison he was “too stupid to learn anything.” Work was no better, as he was fired from his first two jobs for not being productive enough. Richard Branson was a pretty bad student – he didn’t get good marks and he did poorly on standardized tests. You have to encourage our youth and help them along the way and not traumatise them for the rest of their life. In the NT a significant number of students’ mother tongue is not English. NAPLAN questions are in English. Not only are the results in year three fairly meaningless (except to demonstrate that young children whose mother tongue is not the language they are tested in tend to have worse results than those tested in their mother tongue) but the tests are cruel. Children go home having been effectively told they are failures. Such a start is likely to affect their attitude to schooling for the rest of their lives. If a group of Melbourne children were tested in Warlpiri or Luritja, the poor little buggers would fail miserably. Mercifully they are not. Learning needs to be driven from the home environment. Parents that care about their children’s education usually end up with well educated children. Educate the parents, we need them to care more. How many times do we have to rewrite the issues with NAPLAN and it has never worked. It is not able to work. It is a sham. You buy books for students how to prepare for the test. How is this a true scope of the abilities for students? It is not, it is formulated to give value stats of the test, not the abilities and struggles of students. Why are we still using this ridiculous system? The education department heads are a complete joke. That is why schools are failing our kids. End of semester outcomes reflect the abilities of students. Not some fabricated test to avoid facts. Just heard the figures that nationally Australia spent 40% more on education over the last decade and the results stagnated. Yes, the tests may be entirely unsuitable yet despite the education system (sadly) concentrating and even training students for these tests there are no real improvements. Rather proves that spending money alone fixes nothing. All the Gonsky funding alone would be money wasted UNLESS other changes were made. Jingoes like “a computer for every child” take the place of real education reforms. Spending (our) money is many a politician’s simple ‘solution’. Public schooling is being run down in Australia. Of that there is no doubt. It’s beyond argument. Statistics can lie, but do they so consistently lie? The real question is whether it’s being done on purpose, or simply by neglect, or a product of social breakdown and lack of discipline in schools reflecting social norms. Here is where one’s politics comes into play. Is it neglect of government; neglect of school administrators; neglect by unsuitable or under valued teachers; neglect of students; and finally neglect of students’ families that do not respect or value education? Whatever the reason parents who DO care know it, and make huge sacrifices to put their kids into private schools where there is better discipline and local autonomy. It’s beyond sad. I wonder how bad it has to get before we the voters demand serious change. I am all for a better education for my grandkids than I had. I do have to question the need to cuts to teachers in the past, that was a long fight but government held out to do what? Report that “Naplan results are a tool we will use to better focus our attention on areas in need”. Teachers already focus on teaching. Pay them what they are worth and support them. My grandchildren come home and tell me what they learnt from “The Teacher” – not politicians!